You’ve thought long and hard about how best to invest in new technologies. You know integrating your communications tools could yield huge rewards. But how can you ensure your people adopt, use and benefit from the voice tools you include in your unified communications rollout? This whitepaper gives you the key 10 steps that will provide you with a framework for planning, deploying and enhancing the audio element of your communications strategies. 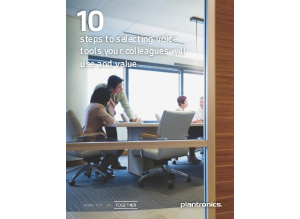 Download now to discover the tools, tips and strategies needed that will make it easier for you to deploy the voice element of your Unified Communications.